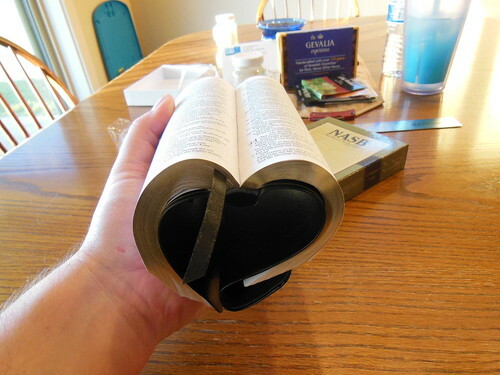 Need a Complete Bible in a Handy Size to Slide into a Pocket? The NASB Compact Bible in Black Bonded Leather with a Snap-Flap Fills the Niche at a Great Value. 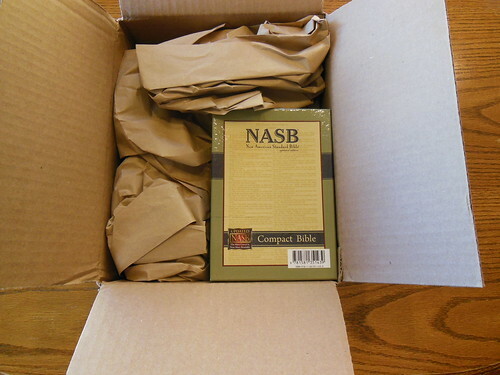 As a fan of the NASB translation, I find myself needing a copy of it for several applications. The problem is that my choices are limited once I demand a sewn binding. 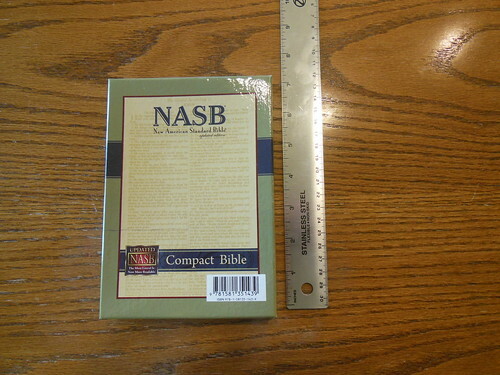 If I want a compact NASB with a sewn binding, I can either spend around a hundred dollars for a Cambridge, or I can spend around twenty for a Chinese made Lockman Foundation. I know how nice a Cambridge can be, but I there are some benefits to spending less, especially when you are getting a compact Bible. If you tend to carry the compact with you everywhere, it can get worn out from travel. You might also forget it on a table somewhere after a talk. Not to mention the accidental spills and drops. If you spend around a hundred dollars on a Bible, and then have all of that happen, it would probably give you some heartburn. Then there are the numerous glued Bibles from companies like Yawn-durp-ven, you know who I mean. I can’t begin to tell you how much I hate glued bindings. Constantly losing the front pages and pages from the back, the spine breaking in the middle, I mean, come on already! I’ll pay the extra few bucks for a sewn binding. Wait, what’s that? 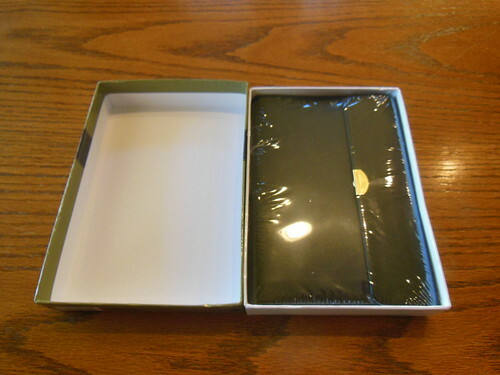 Lockman Foundation makes a value priced, compact Bible, with a sewn binding? Do tell. Yes, it is true. Now don’t get me wrong, these are not premium Bibles, but if you need to have access to the printed word and you don’t want to use an app on your phone, this little Bible could do the trick. I know, I know, “It has rubber on the flap… It smells funny… The pages pucker where the treads secure the signatures… It is covered with bonded leather…” I understand the complaints, but there has to be a compromise. Like I just got done explaining, do you want to lose a hundred dollar Bible at a coffee shop? I didn’t think so. 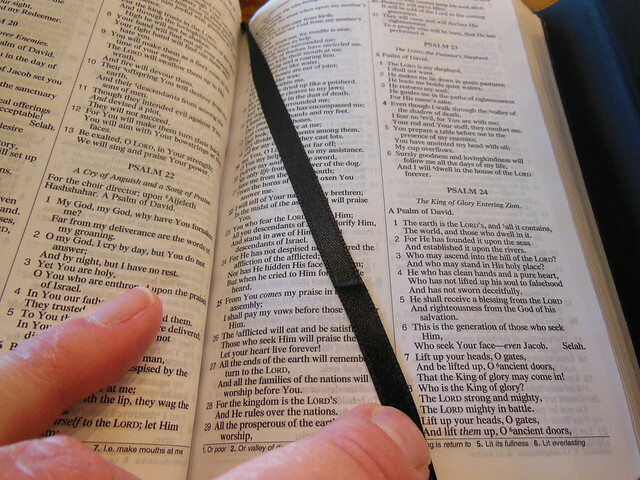 Do you want to open your Bible up to help someone out, and have pages fall out on the ground? I didn’t think so. So you see there is a niche that this little Bible fills quite well. 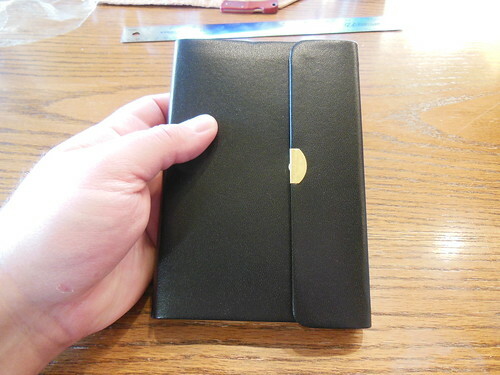 As for some of the gripes, the rubber flap holds up much better than just having a bit of bonded leather there. The smell is not as strong after it airs out for a couple days. The puckers are there, you have a sewn binding, deal with it. Better to not have pages falling out. The bonded leather keeps the cost down. Hides are expensive. This is a value Bible. You can even afford to lose them or give them away. I think I saw this one online for like fifteen bucks. Come on, that is extremely affordable. So, don’t be a Bible snobs like Bob, get what works for your application. Time for the rundown, this Bible was shipped in a cardboard box, packed with paper padding. It was in a two piece retail package. Inside the retail package it was wrapped in plastic. Due to the sewn binding this Bible can be opened up without hurting the spine. The spine is stamped with, “New American Standard Bible” in gold. The snap-flap protects the page edges, so you can just slip it in a pocket. The verse format helps you find verses quickly. The 6.5 pt. font makes it legible. The end pages are a bit flimsy, but I think that is to keep this small edition from being too rigid. Overall, this Bible performs the purpose it is intended for. I would recommend it based on the low price and sewn binding. The NET Bible, Full Notes Edition, for Language Geeks or for all Bible Students? You Can’t Sell What’s Not Yours!